I begun the tournament with a civil war and it happened that I was about to finish the event with the civil war too! This army is faster than mine, hits harder and can potentially soak up some damage better than my fragile units too. I expected it to be more aggressive and try to force one-on-one combats where it has an advantage. With 3 flying elements it would also be difficult to block these units until disrupted. A small contingent of Archers and Mage I would also need to take into account that the damage from shooting can start routing my units too. Basilean Allies were a great choice too as Elohi can comfortably operate alone, as they self-inspire and cannot be wavered. Eliminate is the scenario I have never played before. It was thus very interesting to see if I can come up with the plan on the spot. All the drakon riders and their lord got a token each. That made me think I may need to be even more careful with them as they had a bulls eye mark on their backs now. 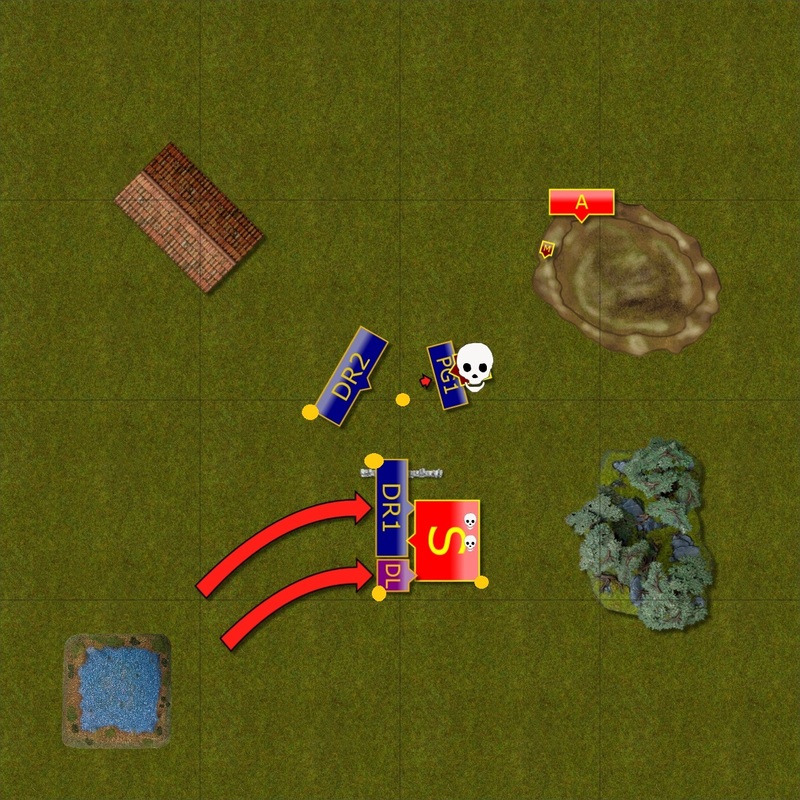 At the same time Craig's units looked much better equipped for this scenario as they can still commit to combats and not necessarily be vulnerable at the same time. 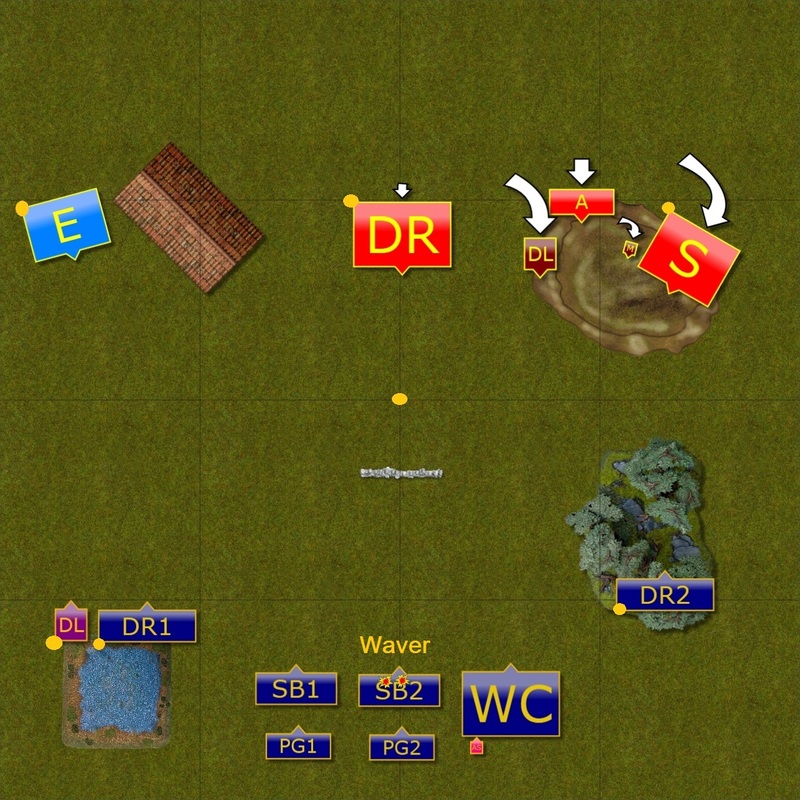 The tricky part was that we could not simply play defensively as that middle token had to be collected by someone. Interestingly, in Craig's army there were only two elements who could do that! 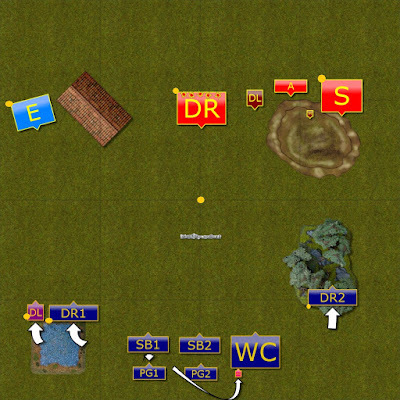 I decided to adapt the plan to the scenario by following the initial idea of targeting a single unit with shooting and trying to intercept it while keeping the safe distance for as long as it is practical. 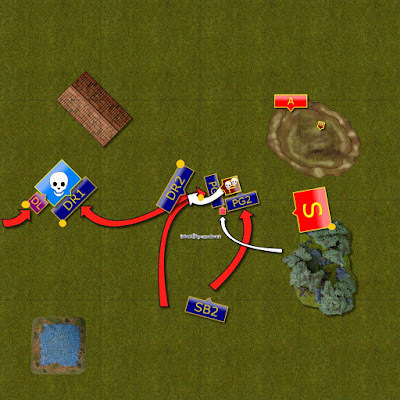 If I succeeded in eliminating at least one of the units that was holding the token and not lose any of mine in the process, then I thought I would be able to have a shot at winning the scenario. This time it was my opponent who had the first turn. Elves and Elohi are shy to move forward. 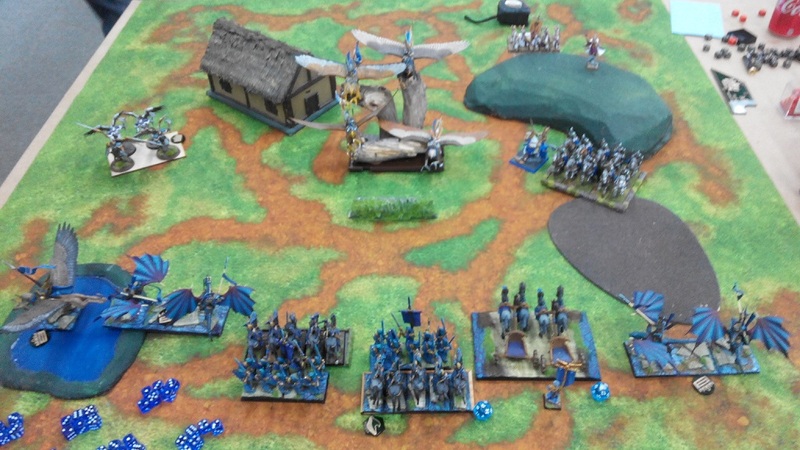 Surprisngly, Elves and their Elohi allies did not moved fast forward but advanced cautiously, making sure that if any of the opponents could charge, it would not be more than one unit against the same target. 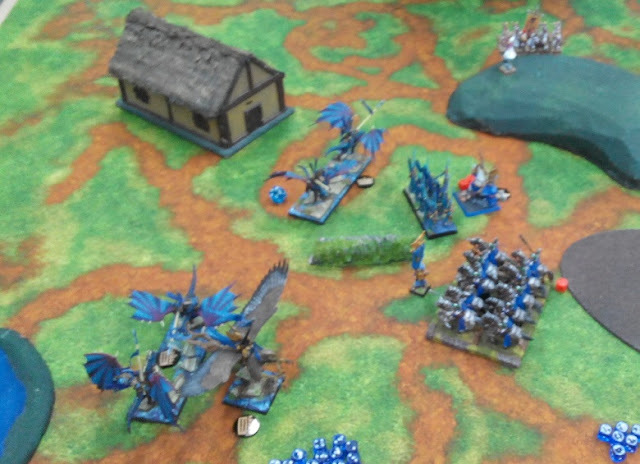 Elven mage sent a few lightnings against Silver Breeze cavalry but the damage was not big enough yet to had any further consequences. The Outcasts do not move much either. 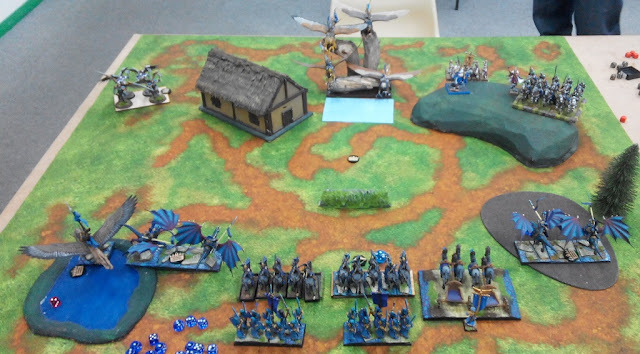 The Outcasts focused their ranged attacks on the Drakon Riders in the center and that helped to inflict some damage. The units just made sure they are in safe distance and the Drakon Riders moved a little towards the enemy to further discourage any advance. 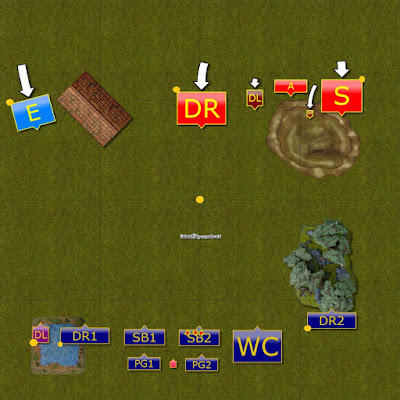 The units moved forward only a little to maintain the pressure on the enemy shooters. 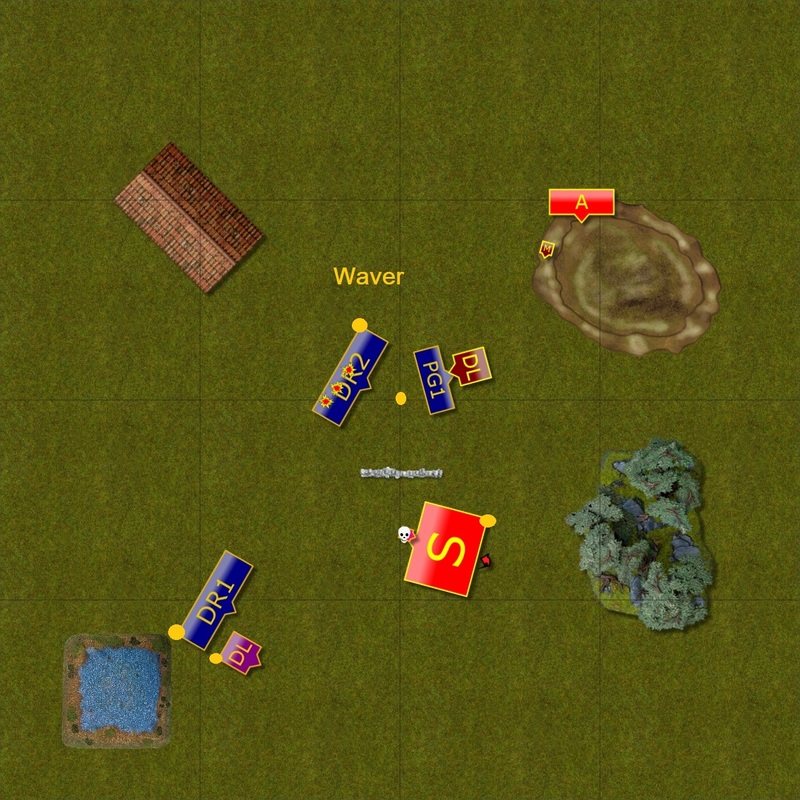 The mage and the archers kept shooting at enemy Silver Breeze and this time the fast cavalry wavered. The shooting is quite efficient. 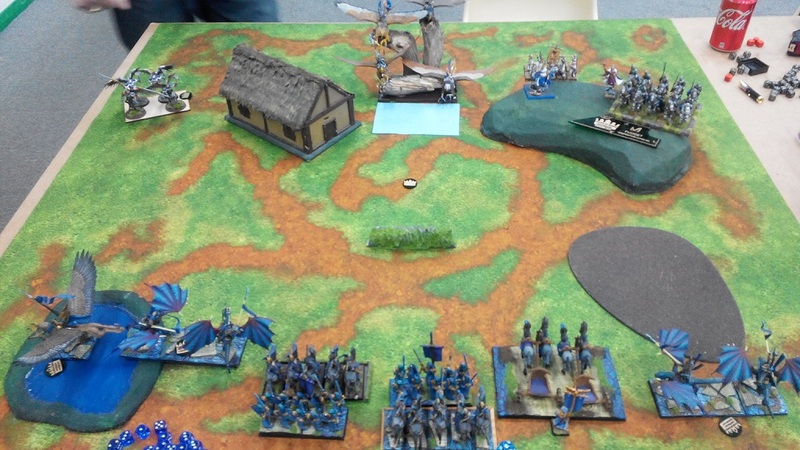 Taking advantage of the enemy slower advance, the Outcasts kept shooting at the Drakon Riders. This time only two units were able to do so but scored a substantial damage nonetheless. 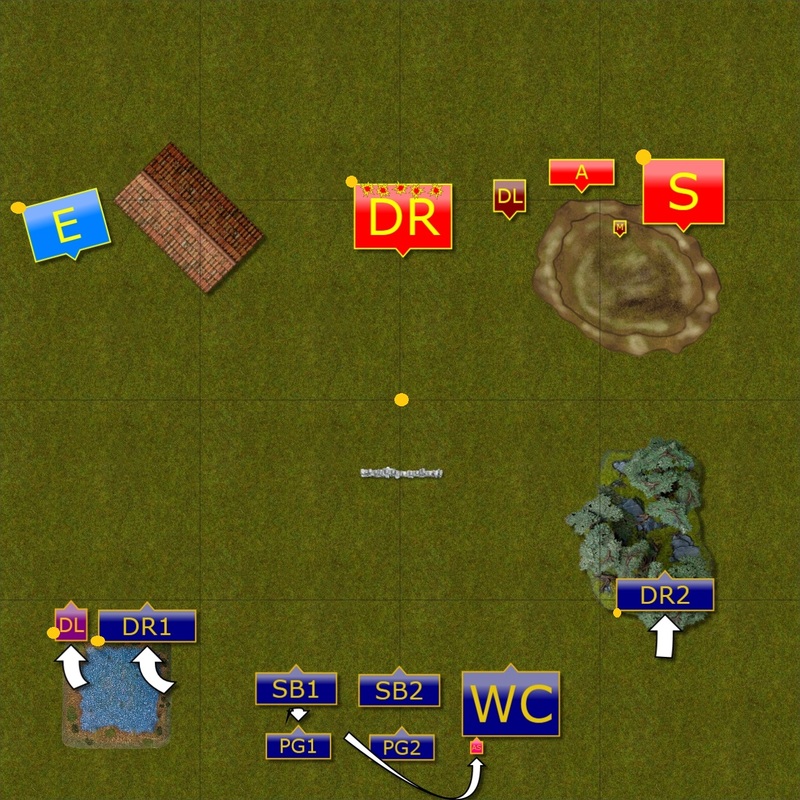 Other units kept steady and re-adjusted the positions slightly. 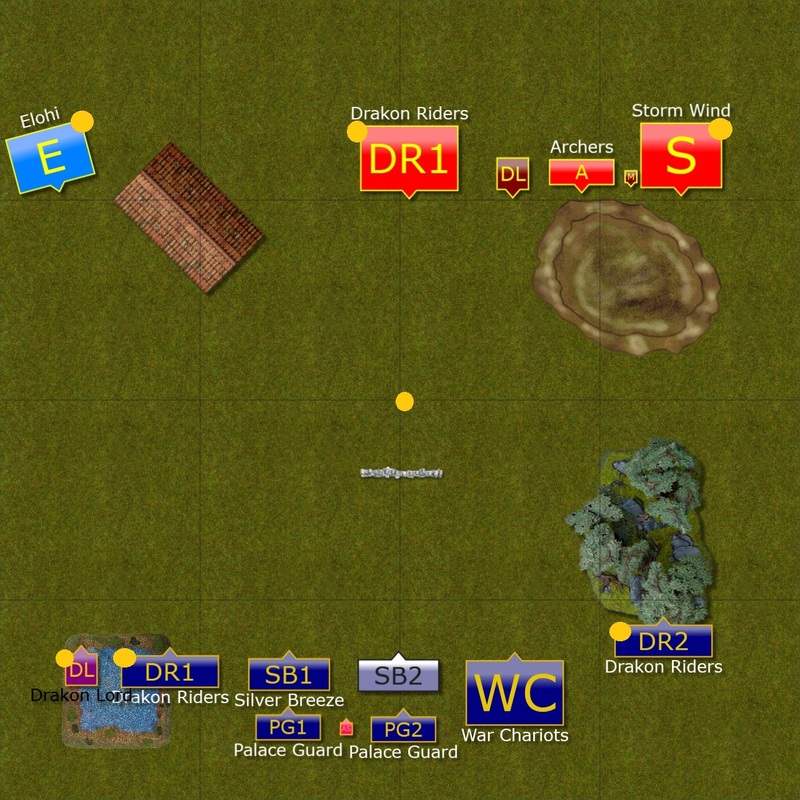 Elven commander decided that another round of shooting like that and his army is going to take real damage so he ordered his units to move into positions to attack. 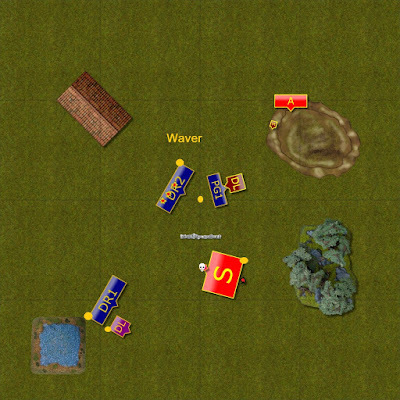 The mage and the archers switched the target and this time it was the chariots that got the attention. 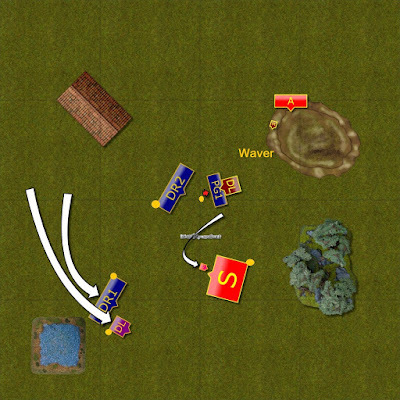 As the enemy advanced the Outcasts decided the best form of defense is offense and they attacked to intercept the units. It was also the fight to gain air superiority and the Outcasts had to co-ordinate the charges in order to shift that balance into their favor. 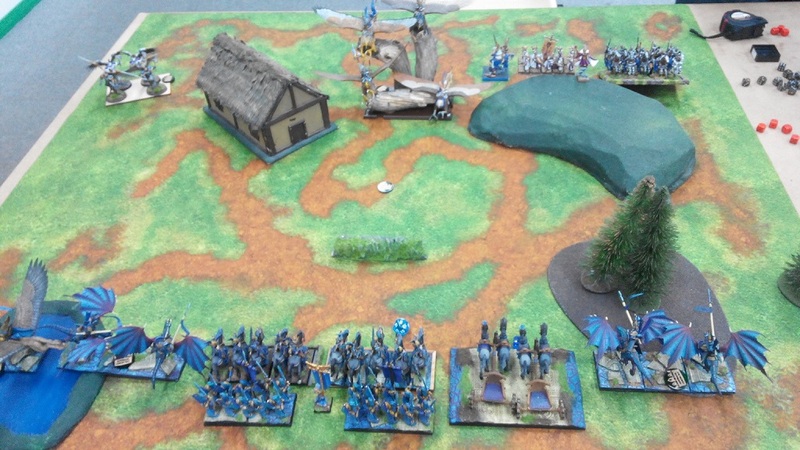 The Drakon Riders spearheaded the attack and charged their wounded counterparts in the middle. 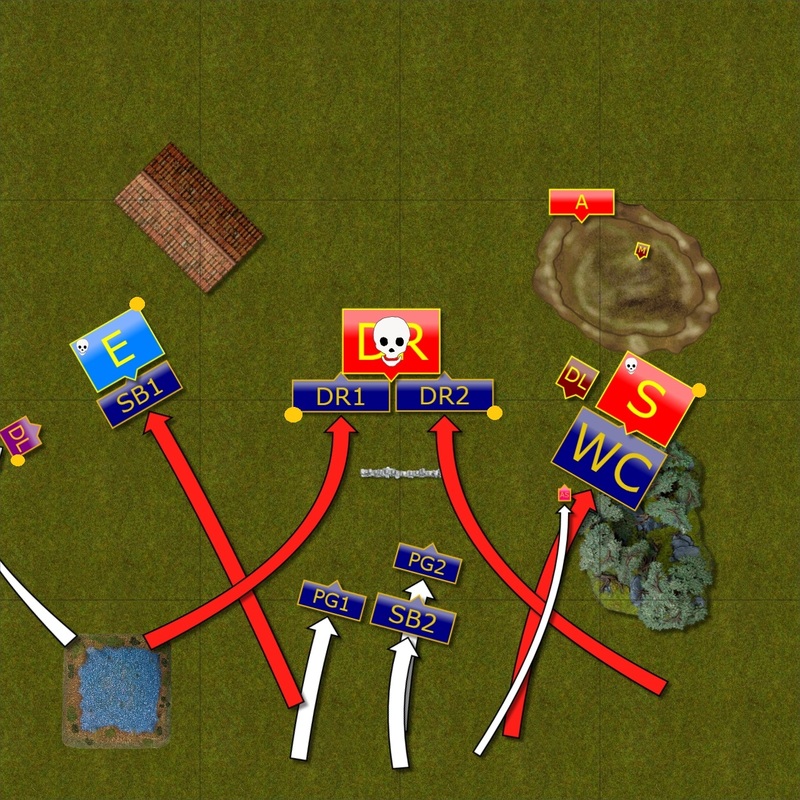 The attack proved to be very successful and both regiments reformed to face respective flanks. At the same time the fast cavalry on the left flank pinned down enemy Elohi. 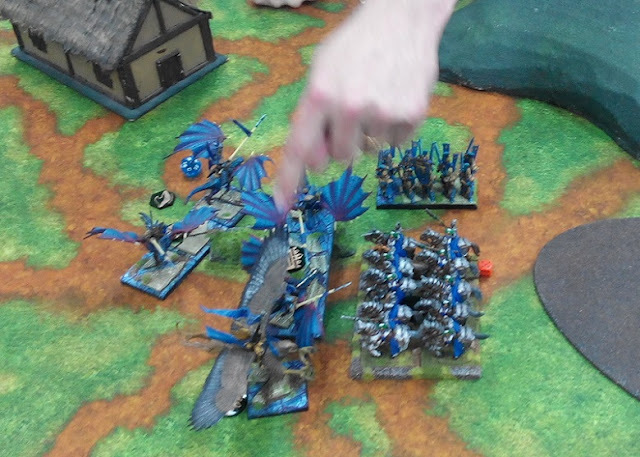 Silver Breeze had no chance to do much damage but they succeeded in distracting the angels and allowed drakon riders to threaten the flanks of the unit. 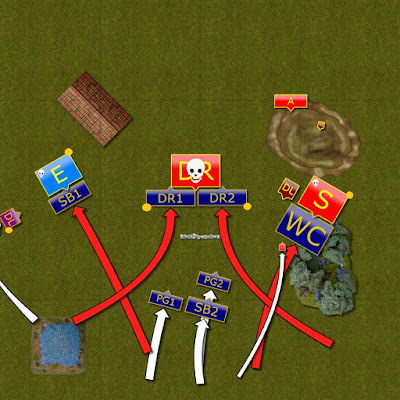 The War Chariots attacked on the right flank in the similar fashion to slow down Storm Wind heavy cavalry. Palace Guard followed at speed in order to aid the first wave of the attackers. Elves and Elohi hit back. 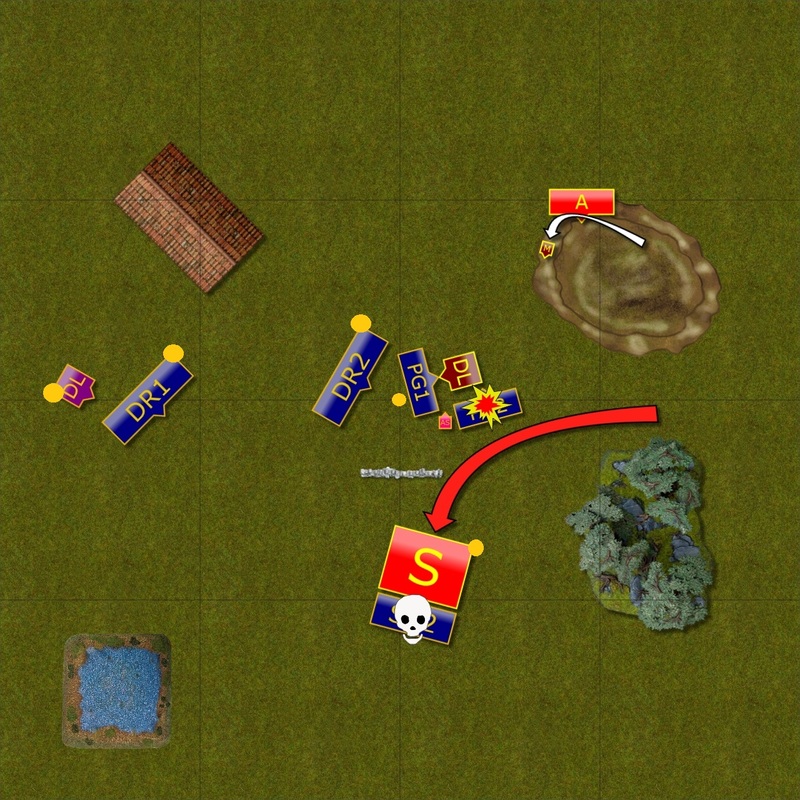 The bloodily combat continued and this time the Outcasts started losing the units. 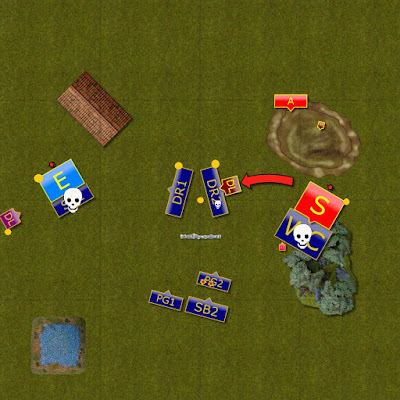 First the Elohi easily defeated Silver Breeze cavalry but were in a difficult spot anyway. No matter how they reformed one enemy unit would be threatening their flank. In the middle the commander of the army attacked enemy Drakon Riders alone and the best he could achieve was to prevent them from flying away. 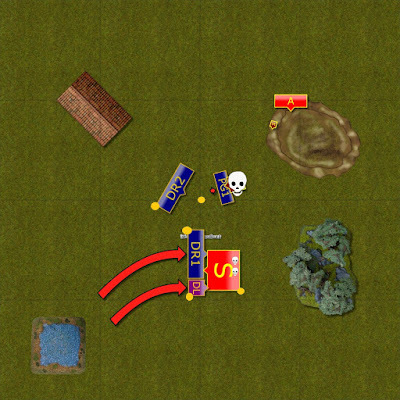 Last but not least, the knights easily destroyed the chariots and started outflanking maneuver. 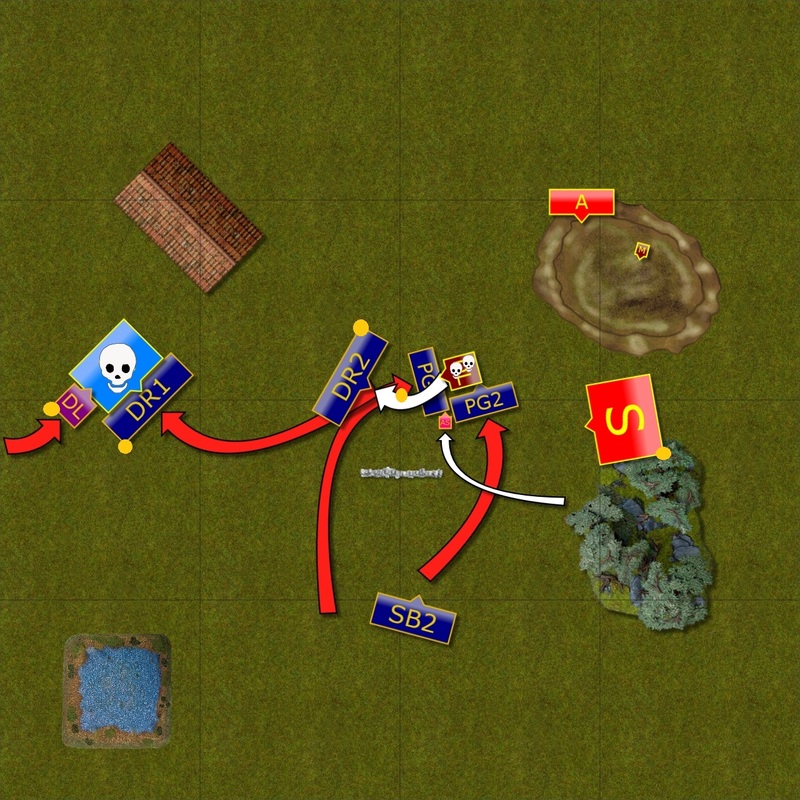 Left flank is under control. 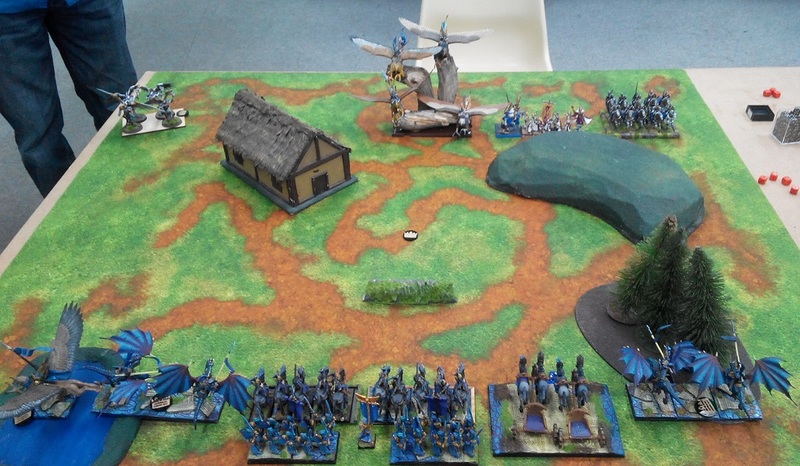 Drakon Lord and one unit of Drakon Riders attacked Elohi together and that combined charge was enough to rout the enemy. The left flank was under control. In the middle, the second unit of Drakon Riders withdrew to make room for the Palace Guard. 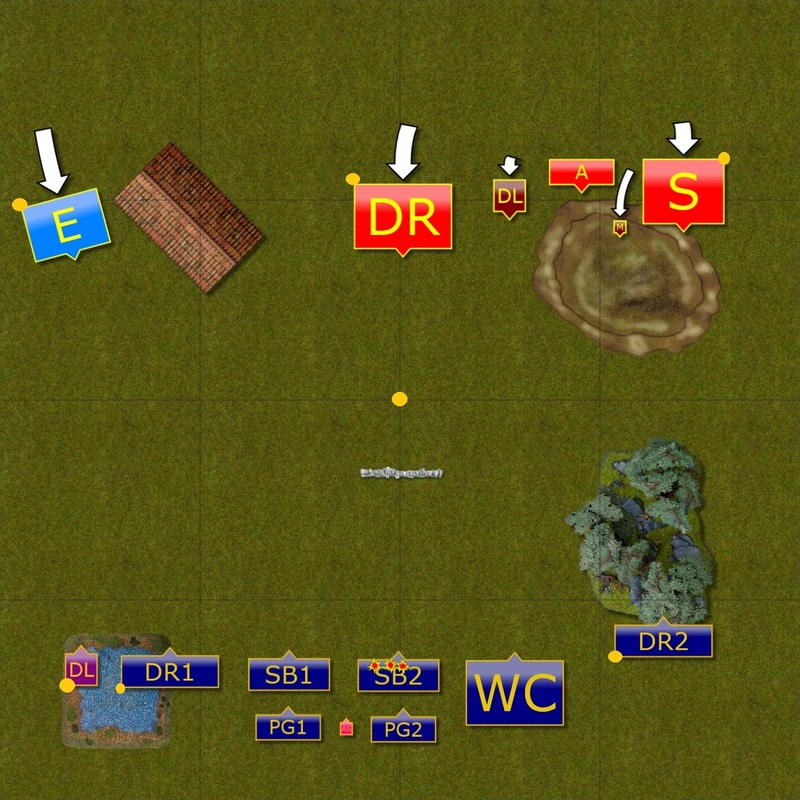 The elite infantry charged in but the stubborn enemy commander held his ground! 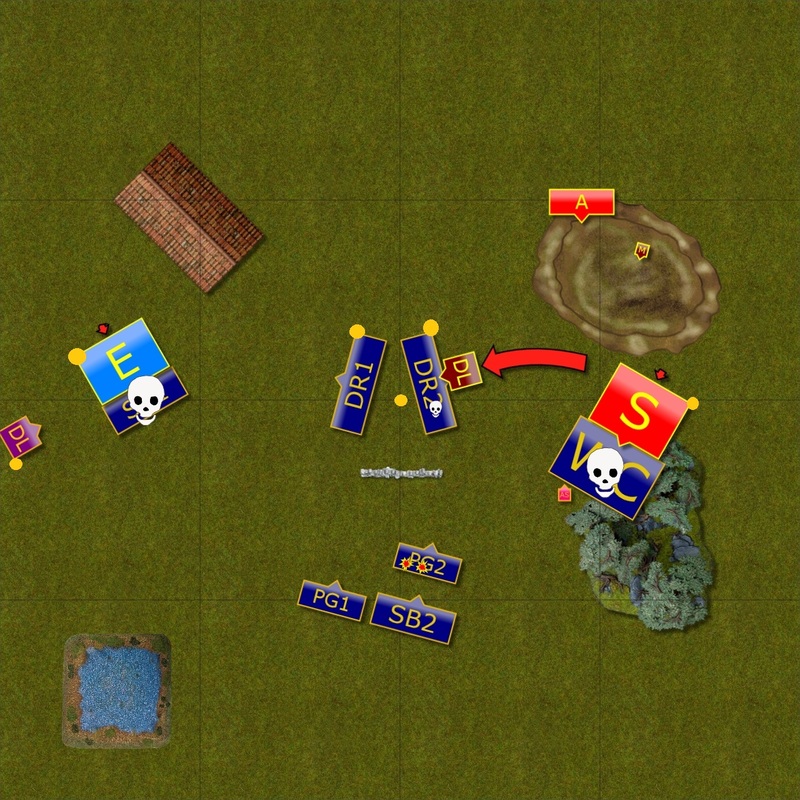 Despite the loss of two powerful units, Elves continued to fight and two more enemy units were claimed. First, the second squadron of the Silver Breeze cavalry and then Placa Guard fell to the ranged attacks. The enemy commander holds again! 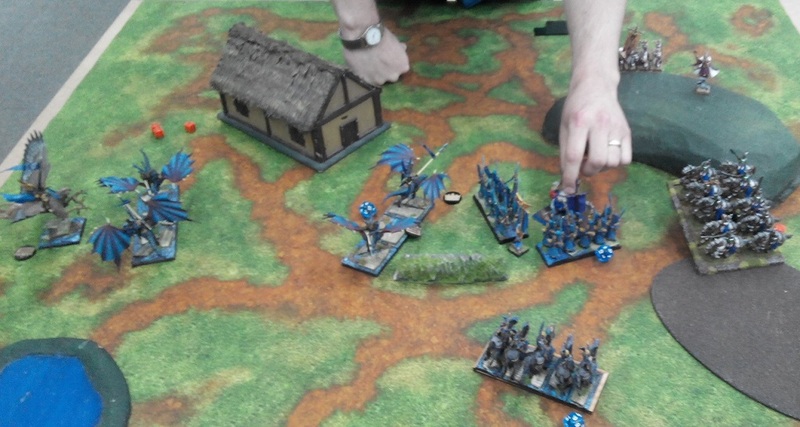 The Outcasts pressed again and this time the enemy commander got wavered. However, in order to slow down the Storm Wind cavalry the brave Army Standard had to step in. 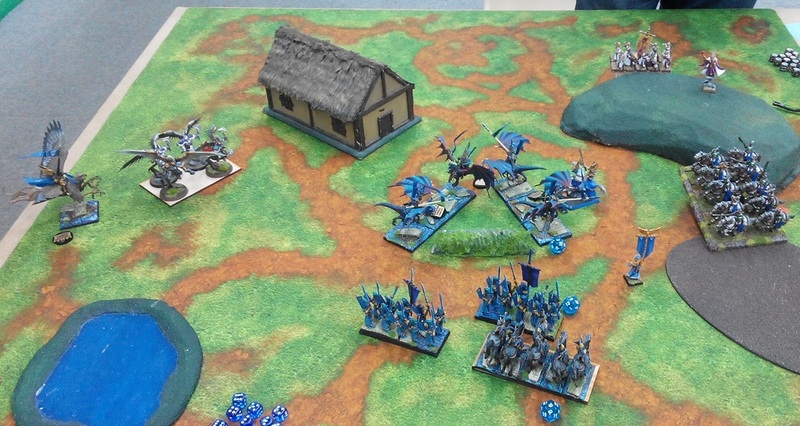 Would the Drakon Riders be able to get to the positions for another powerful attack? Storm Wind cavalry captured the Army Standard and prepared for the attack of the enemy. 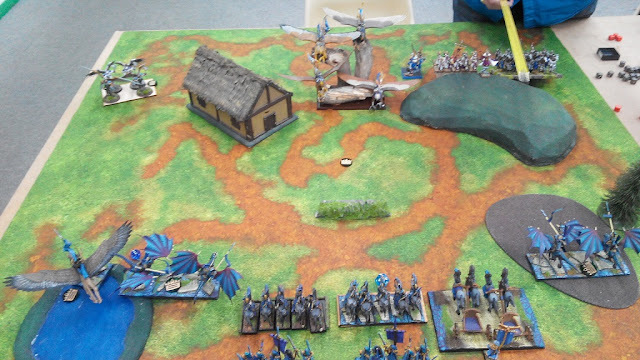 However, the mage and Archers helped a bit by wavering the enemy Drakon Riders so that they would not be able to take part in the attack. This time the Elven commander got captured. Drakon Riders with their Lord attempted a frontal assault but it was not enough to rout enemy knights. 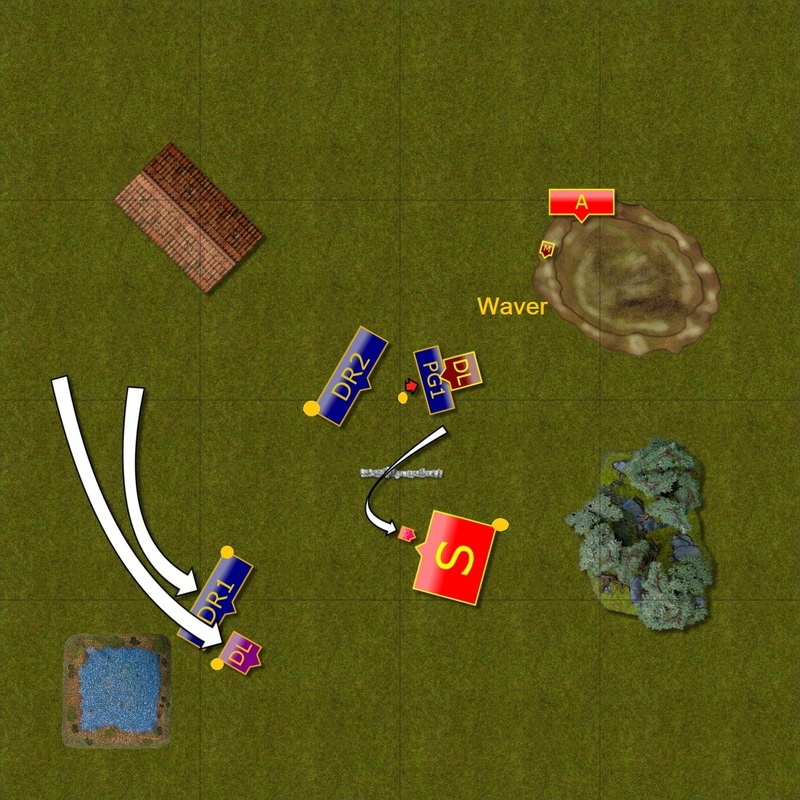 However, that secured the advantage the Outcasts gained earlier and the Elves, seeing that the battle is lost, withdrew to avoid further casualties. This time I won but I keep wondering what would be the result if Craig focused all units on the single flank and pressed forward aggressively. I think the fact that we both carried tokens with our fastest and hardest hitting units made us more cautious. Maybe even too much at some moments. I definitely got lucky with some of my rolls for shooting at the beginning of the game. There are situations that I can score zero damage with 3-4 units shooting at the time but there are also moments, like in this game, when I score well above the average. While I cannot rely on that I was glad I could use the opportunity to eliminate very dangerous unit early. It was also good I noticed the chance to intercept Elohi with Silver Breeze cavalry. They had 7 attacks and I needed one success hitting on 5+ and damaging on 5+ so I think I had a good chance to do so. What was also important is that as Elohi are height 2 and so is the cavalry, it means that some units may not be visible and Elohi would be forced to counter the attacking unit. That bought enough time to attack them again with Drakon Riders and the Lord. I would also like to add that despite the loses Craig kept fighting and claiming units one by one. If only his shooting was more at an average level my casualties would have been higher. 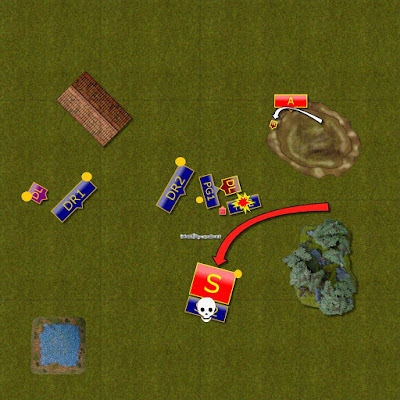 It shows that even if I manage to win the scenario this army still has to pay the price. That concludes the last report from the Valley of Kings 4.